Before I even knew his name, I was a fan of Paul Flato jewelry. I was introduced to his talent when I first saw Holiday, a 1938 film starring Katharine Hepburn and Cary Grant. During that viewing many years ago, I remember wondering if the fabulous three-strand diamond necklace Hepburn wore was real. Indeed, it and the other pieces in the film were fine jewels designed by Flato, at the request of George Cukor, the film’s director. The designer even received what was then a rare on-screen credit. The film opens with Johnny Case (Cary Grant), just back from vacation in Lake Placid, visiting his closest friends to tell them he is engaged to Julia, a woman he met on his trip. He knows nothing about her background or family. When he arrives at the Park Avenue address she has given him and sees a stately mansion, he rings the bell at the back door, thinking that she works for the family who live there. Julia is, in fact, the daughter of Edward Seton, a very wealthy banker and widower. She introduces Johnny to her older sister and then leaves to join her father at church, to break the news of her engagement. Johnny agrees to return for lunch with the family. Arriving early, he spends time with her unconventional, outspoken sister, Linda (Katherine Hepburn), and her well-meaning, alcoholic brother, Ned. Johnny tells Linda about his background and his dreams. Because he has worked very hard since childhood, he wants to make a fortune quickly and then take an extensive holiday to find out the true meaning of life, while he is still young. Linda, in turn, confesses that she (the black sheep in the family) and Ned (who reluctantly works at their father’s bank) have never found their places in the world. At first Mr. Seton is unwilling to grant his permission for the couple to marry. He relents when he finds out how successful Johnny has been at his job. After the engagement is announced at their New Year’s Eve party, Seton offers Johnny a position at his bank. When the bridegroom-to-be confesses his plans to Julia and her father, they both react with disdain. In the meantime, Linda tells Ned that she has fallen in love with Johnny. The story continues as Johnny struggles to decide which path to take: his plan for an immediate long-term holiday abroad with Julia as his wife, or Julia’s plan for their marriage followed by a job at the bank and postponement/abandonment of his dream. I won’t spoil the movie by revealing more of the plot, but I will promise you that magnificent jewels and some fun acrobatics performed by the film’s stars await you. Mark your calendar: according to the TCM website, the film will be broadcast on December 31 at 11:15 am (ET). In April 1938, a month before the film opened, Women’s Wear Daily (WWD) wrote: “The fact that some $600,000 worth of jewels from Paul Flato are used in the production has led [Robert] Kalloch, who designed all of the costumes, to keep his lines classic, as the best background for the jewels”. Following the film’s debut, two more articles about the costumes and jewelry appeared in WWD – in June and July. Let me tell you about my favorites among the Paul Flato jewelry. When Linda talks with Johnny while waiting for her family to return from church for lunch, she is wearing a black enamel hand with diamond cuff at the throat of her white silk blouse. 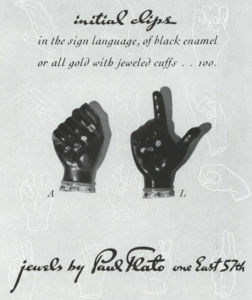 The piece was one of Flato’s “initial clips in the sign language”, shown in this ad from Vogue. On New Year’s Eve, Linda wears a black silk-jersey dinner gown adorned with spectacular jewels, shown in this movie still. Hollywood Jewels describes these pieces as “a diamond ‘toe’ ring (named for an Egyptian ring worn on the foot), a sunburst brooch of canary diamonds, and a dazzling three-strand diamond collet necklace with a three-inch diamond loop that hangs gracefully down her back, a beautiful detail that complements the shoulder-length hairstyles of the period”. Linda is wearing the “toe” ring on her finger. You have to watch closely to see the back of the necklace. Paul Flato (1900 – 1999) was born in Shiner, Texas. After attending the University of Texas at Austin, he moved to New York in the early 1920s to attend medical school. But a downturn in his family’s finances took him in a different direction. After working as a watch salesman, in 1927 he launched his own jewelry boutique on East 57th Street. Creations for his wealthy clients caught the attention of fashion magazines such as Vogue and Harper’s Bazaar, and then Hollywood. On March 4, 1938, Flato opened a boutique on Sunset Boulevard. 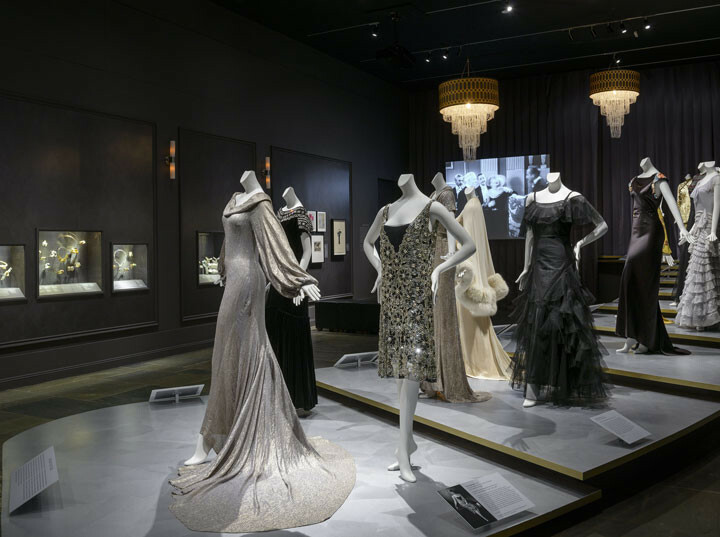 On display at the grand opening were jewels he had designed for Linda Lee Thomas (wife of Cole Porter), Elsa Schiaparelli, Elizabeth Arden, and actor Marion Davies, among others. In attendance were socialites, movie stars, and royalty. Following Holiday, Flato designed jewelry worn by Virginia Bruce in Hired Wife (1940), Greta Garbo in Two-Faced Woman (1941), Merle Oberon in That Uncertain Feeling (1941), Rita Hayworth in Blood and Sand (1941), and Marlene Dietrich in The Lady is Willing (1942). According to Penny Proddow, a jewelry historian and author who was quoted in Flato’s New York Times obituary: “He was the first of the major American jewelers to do highly imaginative work on a par with European jewelers. … He would take his ideas to his four designers – they were his hands – and they would go on from there to his workshop”. 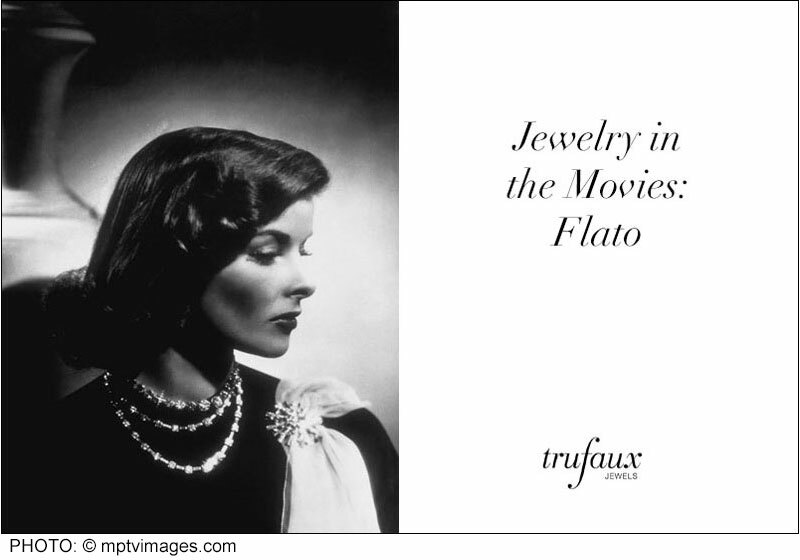 Read Elizabeth Irving Bray’s book Paul Flato: Jeweler to the Stars. 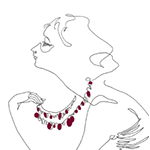 You can also see a number of Flato pieces in the article on the Antique Jewelry University website. Your articles are always well researched & well written. Thanks for a very good read! Thanks, Patricia. I’m glad you liked the article — it was fun to write. Thank you for another wonderful article. My own love of old movies goes back almost before my love of any and all jewelry which started in my teens. I have seen this movie many times and loved it for many reasons and now you have brought more value to watching it again! Thank you for sharing such insight and details. You are a gem! Thanks for your compliments, Lori! I am a life-long fan of black-and-white films. I never tire of seeing the same ones over and over because I always notice something I hadn’t seen before. 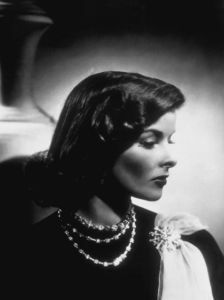 As I was fast-forwarding yesterday to check on something Katharine Hepburn wore in ‘Holiday’, I noticed the back of her black dinner gown and the back of the necklace for the first time. I love to write for my “Jewelry in the Movies” series. Stay tuned for more!